For more tackle tips click here. Tackle Tip Thursday is live from Fred Hall Show! Thank you to Izorline for letting us use their booth and product. Today we have Capt. Art who goes over a FAQ at the show, like what kind of line you need and what’s good to have on your rees. Capt. Art gives us the rundown on all things fluorocarbon. For more Tackle Tips hook them here! Happy Tackle Tip Thursday. Today, we have a special guest Lori from Turner’s Outdoorsman. Lori gives us some of the most haves you forget to grab for your tackle box. Buffs are a big deal. Don’t leave home with out it a Buff and gloves. 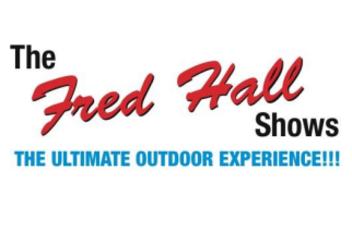 The Searcher crew as well as Lori and Turner’s Outdoorsman are headed to the Fred Hall Show in Long Beach, March 6th- 10th. Come by and say hi. (Maybe even pick up a Buff.) Thank you to Lori and Turner’s Outdoorsman for letting us come by. 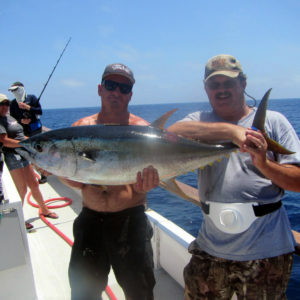 Tackle Tip Thursday is all about the Yellowtail and how to use more of the fish. Our friend Tommy goes over this delicious part of the fish and how to cook it. Little fun catch in the off season. 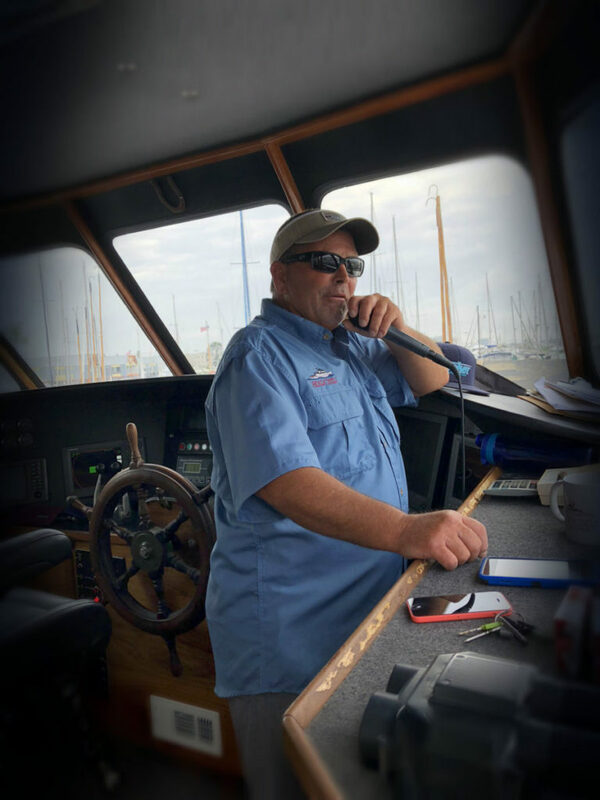 Thank you so much Tommy and Catalina Offshore Products. 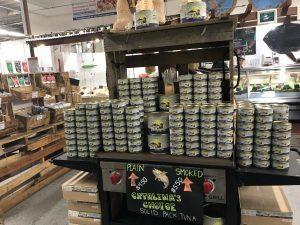 Looking for a way to prepare all your Searcher-caught fish or a use for your canned tuna you made with Dave’s Jarred tuna? How about giving Tommy’s Portuguese Tuna Salad a try? 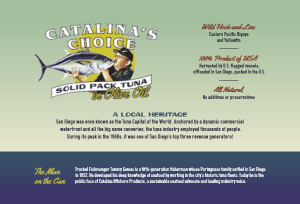 Tommy says you can use Catalina Offshore products Catalina’s Choice solid packed tuna or your own jarred tuna or even steamed tuna. They all taste great. 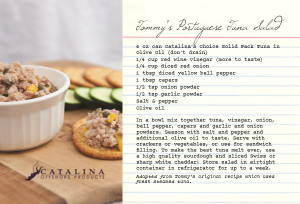 Tommy’s Portuguese Tuna Salad can be an appetizer with crackers and vegetables or an amazing tuna melt. It is all your choice and all delicious and worth a try. 6 oz can of Catalina’a choice Soild Pack Tuna in Olive Oil (don’t drain) or your own, you can also use steamed tuna as well. In a bowl mix together tuna, vinegar, onion, bell pepper, capers and garlic and onion powders. Season with salt and pepper and additional olive oil to taste. Serve with crackers or vegetables, or use for sandwich filling. to make the BEST tuna melt ever, use a high quality sourdough and sliced Swiss or sharp white cheddar! Store salad in airtight container in refrigerator for up to a week. Adapted from Tommy’s original recipe which uses fresh steamed tuna. Happy Tackle Tip Thursday. On this Valentine’s day edition of Tackle Tip Thursday. Today, we have a special guest with one of our favorite Lady anglers Lori from Turner’s Outdoorsman. She gives us a rundown of her favorite fishing and set up. (A great gift for any anglerette on your list.) Rod made by Phenix Rods and reel by Avet reels. Thank you to Lori and Turner’s Outdoorsman for letting us come by. Happy Tackle Tip Thursday everyone. Happy Tackle Tip Thursday and Valentine’s day everyone.